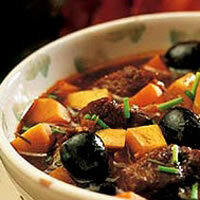 Warm yourself on a cold evening with this flavorful stew. emove cover, turn heat to medium-high and bring to a boil. Add sweet potato, celery root, parsnips, turnips, and olives. Simmer over medium-low heat for 15-20 minutes until vegetables are cooked through. Top with chives just before serving.